Photographs of the (a) bottom side of the rotor, (b) top side of the rotor, (c) top side of the stator, and (d) backside of the stator. Micro-turbo-generator research by ISR Director Reza Ghodssi (ECE/ISR) and his colleagues has been published in the June 2013 issue of the Journal of Microelectromechanical Systems, one of the top journals in the field. The lead author is alumnus Mustafa Beyaz (ECE Ph.D. 2011), currently on the faculty of the Department of Electrical and Electronics Engineering, Antalya International University, Turkey. Beyaz is a former Ph.D. student of Ghodssi. Co-authors include Ghodssi; his former Ph.D. student, now alumnus Brendan Hanrahan (MSE Ph.D. 2013), currently with the Army Research Laboratory; and his former undergraduate student Jeremy Feldman (ECE B.S. 2011), now a student in ISR’s MSSE program. 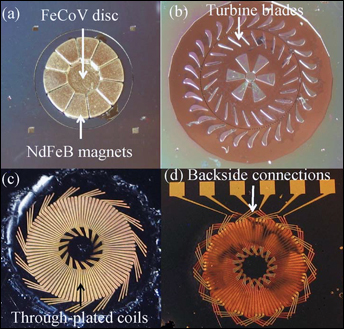 "An Integrated Permanent-Magnet Microturbogenerator Supported on Microball Bearings" represents another advance in the longstanding research into power MEMS devices based on micro-ball bearing technology conducted in Ghodssi's MEMS Sensors and Actuators Lab. The work is the first demonstration of an integrated permanent-magnet micro-turbo-generator supported on micro-ball bearings. It is also the most complexly fabricated MEMS device the Ghodssi group has developed. The article presents the design, fabrication, and testing of an integrated micro-turbo-generator with permanent magnets and micro-ball bearings. The key components are a silicon micro-turbine rotor housing thick magnetic components; encapsulated micro-ball bearings providing a simple actuation scheme and a robust support structure; and wafer-thick stator coils. The rotor and stator components were optimized through theoretical analysis and finite-element simulations for maximum flux linkage and minimum coil resistance. The device provides a flexible design platform for further improvement and will lead to the development of next-generation integrated micro-turbo-generators that offer high power, simple actuation, and robust mechanics with no need for external actuation apparatus. This will be instrumental in the future integration of this type of generator with micro-combustion engines. Why is developing this technology so important? Small-scale and high-density energy sources are becoming increasingly necessary to improve the capabilities and operation lifetimes of portable electronic systems. Miniaturizing large-scale portable generators running on hydrocarbon fuels down to microelectromechanical systems (MEMS) dimensions has been of particular interest, due to the high energy density of the fuels surpassing that of the battery technology. Magnetic electromechanical generators with or without turbine parts are integral components of these power systems driven by combustion engines. Demonstrating magnetic electromechanical generators on the microscale (microgenerators) is essential for developing hydrocarbon-based as well as other gas flow-driven MEMS power sources.